Many people do not value power washing as much as they should, and some commonly believed myths are the main reasons people take this service for granted. This post reviews five of the most prevalent myths about power washing and what is true instead. Cleaning concrete, stone walls, and other open paved surfaces can be a very labor and time-consuming process. However, thanks to advancements in mechanical technologies, we have powerful machines to make the work easy. Power washing has grown to be a very useful strategy for eliminating mildew and mold on concrete surfaces and even stains on a wood or brick patio. Whether such a service could be ideal to clean your walkways or maintain the sparkling image of your building, here are five myths about pressure washing that you should stop believing. Nothing could be further from the truth. Pressure washing is essentially the forceful removal of hard stains and stubborn elements on the surface—most of which are not visible to the naked eye. There is no reason to wait until your property is unsightly to conduct power washing; after all, preventing stains is better than waiting for it to accumulate. Power washing your property regularly removes and prevent molds and stains and leaves your home or business premises clean and presentable. If it were true that water only at high pressure can remove all kinds of dirt, stains, and other unwanted elements, then you could rely on rain alone to keep your home or office looking clean. In reality, this is not the case. The truth is that professional power cleaning involves the use of specially-selected detergents with the strength to clean stains and potential mold from a surface. For some types of stains, specific solvents may be used with hot water to successfully clean stubborn stains. Yes, you can do it yourself, if you have the right machine, knowledge, and experience to safely and efficiently remove specific types of molds, dirt, and stains. Most people hire the experts to save money and time because of the required experience and knowledge of using the correct equipment safely and effectively. Besides, the best cleaning professionals today use environmentally friendly products and they know which types work best to remove which types of stains or growths. There are some areas of your house that should be very carefully (or not) power washed because of how sensitive they are to pressure or to water. For instance, overhangs, windows, decorative fypons, and door openings should receive more gentle power washing (or none at all depending on their location, condition, and materials). There are some types of wood which can easily be damaged by high pressure or can absorb water which could lead to water intrusion or water damage. An experienced cleaner knows what areas and materials can be pressure cleaned and which ones shouldn’t be. As with many other service contracts, when it comes to power cleaning, you get what you pay for. Since you value your property, then it deserves the best care. Compare the various professionals offering pressure cleaning in your area and choose the most experienced with the right equipment, and a track record of satisfied customers. Although cost is an important criteria, it should not be the only factor when selecting a professional for power washing your home or office. Many people rely on assumptions rather than facts when keeping their properties clean, and that is the reason they are disappointed and often spend more than they should. 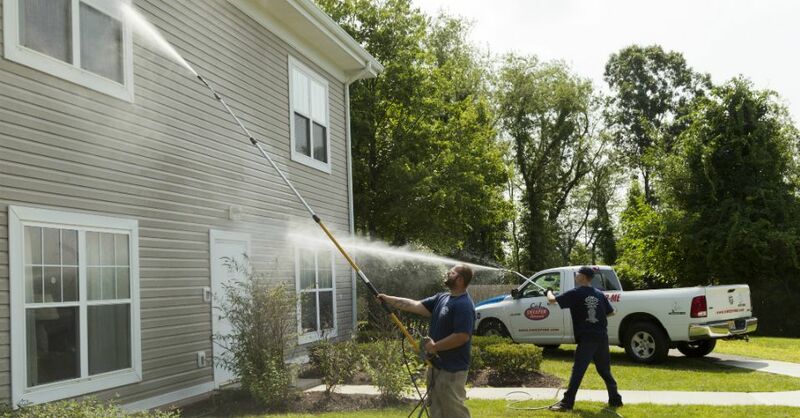 These five myths will certainly help you understand more about pressure washing and help you make the right decision the next time you need it. Looking for advice on power washing? Give us a call at 732-886-1940, we’ll give the facts you need for effective, efficient power washing. Our modern society produces an enormous amount of waste. And that waste production is increasing. By 2030 the amount of household waste will almost double to 3000 million tons annually. Every bag of household waste has produced approximately 70 bags of waste from the production process used to produce the goods that we used and then throw away. Most waste goes to landfills or is burned. Burning waste creates the world’s largest source of dioxins, which is one of the most toxic chemicals known to science. And as a responsible street sweeping company, we would like to see waste disposed of in an environmentally friendly manner. 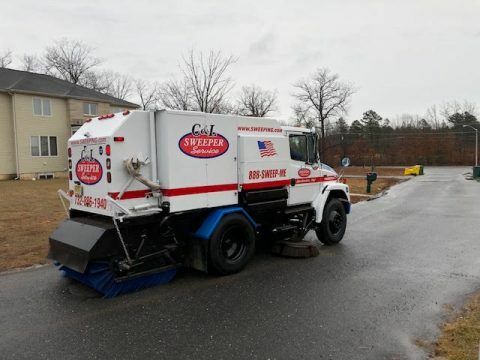 We like to believe that we’re leading the way with effective street sweeping practices (we’ll list those in another post) and by using environmentally safe cleaning solutions in our street sweeper and garage scrubbing equipment. In our opinion, the best way to help with effective waste management is to pay attention to up-to-date practices, keep equipment in tip top shape and constantly measure our street sweeping practices. One of the most interesting forms of measurement (at least to us) is the different types of waste that are generated by different environments. That is, what type of trash, garbage, and debris does our street sweeping find in the different areas that we sweep? We conduct street sweeping throughout New Jersey. Depending on the different areas, we have to plan and prepare our equipment for different types of materials. Here’s some interesting statistics based on our equipment management and reports from our street sweeper drivers. We are contracted to provide street sweeping in cities such as Newark, New Brunswick, Trenton, Princeton, and Freehold. Ok, some of those locations are smaller, but interestingly, produce similar items for street sweeping. We also have contracts with many different New Jersey shore towns. The NJ shore areas we cover include Stafford township and street sweeping in Long Beach Island, Surf City, Harvey Cedars. Paper bags – It’s funny, people put all their trash into a paper bag and then don’t throw away the bag! Household waste – Lots of people don’t use a cover on the trash cans. A little breeze and there’s trash all over. Dead vegetation – Why does it seem to end up on roads? Plastic bottles – What…are the squirrels drinking bottled water too? Pallets – Yes..the wood pallets you find in warehouses. Uneaten food – No need to throw it the trash, let’s just throw it on the floor! Cigarette butts – Does everyone in construction smoke? Well, there you have it, probably the most comprehensive list of different types of street sweeping trash that you’ll ever encounter. Do you care? Probably not…but we do. We care very much about street sweeping trash. We need to have the right professional with the right equipment for the right area to do the most effective and efficient street sweeping job. It’s what we do. Yes, we care about street sweeping. Give us a call at 732-886-1940 if you care about street sweeping too. Garage Scrubbing – Does Your Parking Garage Need A Good Scrubbing? Since the Industrial age, Customers have evolved to associate dirty, filthy, and cluttered places with decline and neglect. If you were to walk into an old garage with this type of appearance — that you have to skip over puddles of oil, unidentified stains, and debris strewn all over the place, what would your perception of the owner be? Not good, that’s for sure. 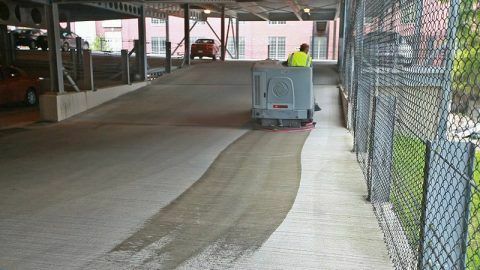 Most parking lot garage owners overlook the importance of garage scrubbing largely because they want to keep costs down but also because they do not spend much time in them. It’s quite common for a property owner to focus their attention on where their client’s customers visit (the stores and offices), not where customers park. In this post, you will learn why it is important for you to regularly schedule garage scrubbing and keep the garage looking good at all times. Safety concerns are the most important reasons why the garage should be scrubbed regularly. A buildup of oil spots and dirt poses a risk that could lead to liabilities such as slips and falls. For example, a person may slip on an oil spill that may not have been properly scrubbed and break their wrist or elbow. Proper garage scrubbing goes a long way to remove these slippery elements from the garage floors to avoid potential legal claims. One of the best ways to retain or create a perception of increased property value is by simply giving it a good scrubbing and making it look clean. This is why people wash and paint their houses just before they put them on the market. A good garage scrubbing will give the garage a clean and attractive look which creates a perception of higher value. Besides, a good scrubbing is the surest way to keep stains from becoming permanent and to keep an eye on other potential problems. The perception a good regular scrubbing creates will translate to happier tenants and even possibly higher rents for the property owner. Curb appeal is vital for any commercial business building. The money the owner spends on the appearance of the parking garage is worth every penny if it means customers and guests feel safe and secure in the garage they park in. Real Estate experts recommend that you retain the curb appeal of your parking garage by scrubbing oil spots and accumulating dirt as soon as you notice them. Garage scrubbing is most effective when it is done at low humidity and temperatures between 70 and 90 degrees. This will make it easy to remove the stains and to allow the floor to dry properly. When was the last time you conducted a good garage scrubbing to get rid of the debris, dirt, and oil—even that which is not visible to the naked eye? If you are unsure whether you need a garage scrubbing, give us a call and talk to an expert or take some pictures and send them to us for advice. Improve the safety of the people using the garage and improve the perceived value your property. A good garage scrubbing is just a call away – 732-886-1940. Power Washing – Does Donald Trump Use Power Washing On His Buildings? Donald Trump’s buildings are renowned for their supreme quality, pure elegance, and sheer class. This is why people are often willing to pay record-breaking fees to rent or purchase them. A case in point is the Trump International Hotel & Tower in Chicago. In May 2016, a condo in this building broke the record for the highest price-per-square-foot for a one-bedroom unit in Chicago. The 41st floor condo, which is 1,450 square feet, sold for $1.64 million. This means that it cost $1,127 per square foot – the highest price in Chicago’s history. This isn’t the first time a Donald Trump building has broken records in Chicago. Back in 2014, the same building broke the record for the priciest residential real estate sale in Chicago’s history when the 89th floor sold for $17 million. What Does Power Washing Have to do With Donald Trump? So, why are people willing to pay over-the-odds to acquire properties in Trump’s buildings? Well, for one thing, the buildings are spotlessly clean. The Trump brand is renowned for its matchless quality. A critical aspect of this quality is cleanliness. Donald Trump’s tenants and clients tend to come from the top 1 percent. The person who paid $17 million cash for the 89th floor was the tech multimillionaire, Sanjay Shah. Tenants on Donald Trump’s famous NYC Trump Tower have included Bill Gates, Harrison Ford, Sophia Loren and the Kingdom of Saudi Arabia. These are people who expect nothing but the best. Donald Trump knows this. As a one-percenter himself, he knows that the standards are extremely high. There can be no compromises whatsoever. His buildings have to be in pristine condition 24-7. There is no margin for error. Therefore, Mr. Trump invests in professional cleaning services to keep his properties sparklingly clean – all the time. This includes power washing. Being a savvy real estate developer, Trump intuitively knows that power washing provides the most effective way for cleaning the multiple surfaces in his buildings. As an astute investor, Mr. Trump realizes that power washing does more than just leaving his properties looking elegant and attractive. This cleaning technique also keeps the properties in peak condition. This reduces the frequency of repairs – thus lowering the maintenance costs. The ultimate result is that the buildings become more profitable. This is something most savvy property owners are realizing. Therefore, anyone who owns, develops or manages buildings needs to maximize the potential power washing offers. This will not only keep the building spotlessly attractive, it will also maintain its integrity over time. The end result is that the building will become a magnet for people looking for quality properties. This will give the building a competitive edge on the market. Now, there is one thing most people will suspect about Mr. Trump. 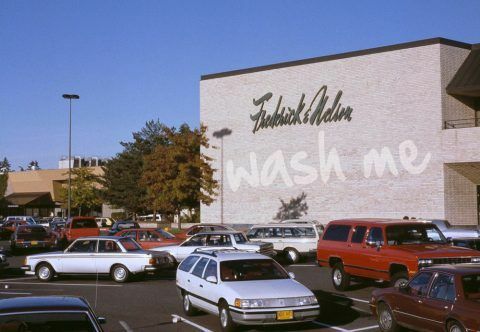 He has never power washed a building in his entire life. All he does is hire professionals to provide power washing services for his buildings. The professionals do the rest. The ultimate question is: who provides power washing services for Mr. Trump’s buildings? The answer to this question isn’t in the public domain. However, there is one company which provides power washing services to buildings whose standards match those of Mr. Trump’s. This company is C & L General Services. Now, C & L has actually never washed Mr. Trump’s buildings (well, at least not yet). However, the company’s power washing services are provided to the highest standards demanded by their customers. As such, if Mr. Trump had an opportunity to utilize C & L Services, it almost a certainty that he would use it again. Basically, if you are a property owner, developer or manager who is looking for professional power washing services, just try out C & L Services. You will be glad you did. Give us a call at 732-866-1940 to find out more about power washing.